Merry Christmas, originally uploaded by captainjay. So the Season is upon us. Hope everyone is having a great holiday. 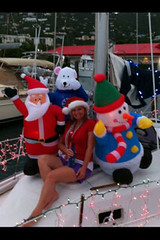 We did the Lighted Boat parade tonight in St Thomas. Deb's Christmas vacation started today, she helped decorate our friends boat. There was a great turnout downtown for the parade.